The Soviet Union introduced collective farming in its constituent republics between 1927 and 1933. The Baltic states and most of the Central and East European countries (except Poland) adopted collective farming after World War II, with the accession of communist regimes to power. In Asia (People's Republic of China, North Korea, Vietnam) the adoption of collective farming was also driven by communist government policies. In most communist countries, the transition to collective farming involved compulsion. Soviet famine of 1932–33. 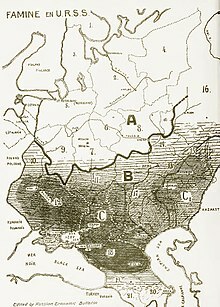 Areas of most disastrous famine marked with black. As part of the first five-year plan, collectivization was introduced in the Soviet Union by general secretary Joseph Stalin in the late 1920s as a way, according to the policies of socialist leaders, to boost agricultural production through the organization of land and labor into large-scale collective farms (kolkhozy). At the same time, Joseph Stalin argued that collectivization would free poor peasants from economic servitude under the kulaks (farmland owners). Stalin resorted to mass murder and wholesale deportation of farmers to Siberia in order to implement the plan. Millions who remained did not die of starvation, but the centuries-old system of farming was destroyed in a region so fertile it was once called "the breadbasket of Europe". The immediate effects of forced collectivization were reduced grain output and almost halved livestock numbers, thus creating major famines throughout the USSR during 1932 and 1933. In 1932–1933, an estimated 11 million people, 3–7 million in Ukraine alone, died from famine after Stalin forced the peasants into collectives (Ukrainians call this famine Holodomor),. It was not until 1940 that agricultural production finally surpassed its pre-collectivization levels. Collectivization throughout Moldova was not aggressively pursued until the early 1960s because of the Soviet leadership's focus on a policy of Russification of Moldavians into the Russian way of life. Much of the collectivization in Moldova had undergone in Transnistria, in Chişinău, the present-day capital city of Moldova. Most of the directors who regulated and conducted the process of collectivization were placed by officials from Moscow. In Romania, land collectivization began in 1948 and continued for over more than a decade until its virtual eradication in 1962. Трудово кооперативно земеделско стопанство was the name of collective farms in Bulgaria. In Hungary, agricultural collectivization was attempted a number of times between 1948 and 1956 (with disastrous results), until it was finally successful in the early 1960s under János Kádár. The first serious attempt at collectivization based on Stalinist agricultural policy was undertaken in July 1948. Both economic and direct police pressure were used to coerce peasants to join cooperatives, but large numbers opted instead to leave their villages. By the early 1950s, only one-quarter of peasants had agreed to join cooperatives. In the spring of 1955 the drive for collectivization was renewed, again using physical force to encourage membership, but this second wave also ended in dismal failure. After the events of the 1956 Hungarian Revolution, the Hungarian regime opted for a more gradual collectivization drive. The main wave of collectivization occurred between 1959 and 1961, and at the end of this period more than 95% of agricultural land in Hungary had become the property of collective farms. In February 1961, the Central Committee declared that collectivization had been completed. This quick success should not be confused with enthusiastic adoption of collective idealism on the part of the peasants. Still, demoralized after two successive (and harsh) collectivization campaigns and the events of the 1956 Hungarian Revolution, the peasants were less keen to resist. As membership levels increased, those who remained outside likely grew worried about being permanently left out. In Czechoslovakia, centralized land reforms after World War I allowed for the distribution of most of the land to peasants and the poor, and created large groups of relatively well-to-do farmers (though village poor still existed). These groups showed no support for communist ideals. In 1945, immediately after World War II, new land reform started with the new communist government. The first phase involved a confiscation of properties of Germans, Hungarians, and collaborators with the Nazi regime in accordance with the so-called Beneš decrees. The second phase, promulgated by so-called Ďuriš's laws (after the Communist Minister of Agriculture), in fact meant a complete revision of the pre-war land reform and tried to reduce maximal private property to 150 hectares (370 acres) of agricultural land and 250 hectares (620 acres) of any land. The third and final phase forbade possession of land above 50 hectares (120 acres) for one family. This phase was carried out in April 1948, two months after the Communists took power by force. Farms started to be collectivized, mostly under the threat of sanctions. The most obstinate farmers were persecuted and imprisoned. The most common form of collectivization was agricultural cooperative (in Czech Jednotné zemědělské družstvo, JZD; in Slovak Jednotné roľnícke družstvo, JRD). The collectivization was implemented in three stages (1949–1952, 1953–1956, 1956–1969) and officially ended with the 1960 implementation of the constitution establishing the Czechoslovak Socialist Republic, which made private ownership illegal. Many early cooperatives collapsed and were recreated again. Their productivity was low since they provided tiny salaries and no pensions, and they failed to create a sense of collective ownership; small-scale pilfering was common, and food became scarce. Seeing the massive outflow of people from agriculture into cities, the government started to massively subsidize the cooperatives in order to make the standard of living of farmers equal to that of city inhabitants; this was the long-term official policy of the government. Funds, machinery, and fertilizers were provided; young people from villages were forced to study agriculture; and students were regularly sent (involuntarily) to help in cooperatives. Subsidies and constant pressure destroyed the remaining private farmers; only a handful of them remained after the 1960s. The lifestyle of villagers had eventually reached the level of cities, and village poverty was eliminated. Czechoslovakia was again able to produce enough food for its citizens. The price of this success was a huge waste of resources because the cooperatives had no incentive to improve efficiency. Every piece of land was cultivated regardless of the expense involved, and the soil became heavily polluted with chemicals. Also, the intensive use of heavy machinery damaged topsoil. Furthermore, the cooperatives were infamous for over-employment. In the late 1980s, the economy of Czechoslovakia stagnated, and the state-owned companies were unable to deal with advent of modern technologies. A few agricultural companies (where the rules were less strict than in state companies) used this situation to start providing high-tech products. For example, the only way to buy a PC-compatible computer in the late 1980s was to get it (for an extremely high price) from one agricultural company acting as a reseller. After the fall of Communism in Czechoslovakia (1989) subsidies to agriculture were halted with devastating effect. Most of the cooperatives had problems competing with technologically advanced foreign competition and were unable to obtain investment to improve their situation. Quite a large percentage of them collapsed. The others that remained were typically insufficiently funded, lacking competent management, without new machinery and living from day to day. Employment in the agricultural sector dropped significantly (from approximately 25% of the population to approximately 1%). Collective farms obtained the name Landwirtschaftliche Produktionsgenossenschaft (LPG). The Polish name of a collective farm was Rolnicza spółdzielnia produkcyjna. Collectivisation in Poland was stopped in 1956, later nationalisation was supported. Collective farming was introduced as government policy throughout Yugoslavia after World War II, by taking away land from wealthy pre-war owners and limiting possessions in private ownership first to 25, and later to 10 hectares. The large, state-owned farms were known as "Agricultural cooperatives" ("Zemljoradničke zadruge" in Serbo-Croatian) and farmers working on them had to meet production quotas in order to satisfy the needs of the populace. This system was largely abolished in the 1950s. See: Law of 23 August 1945 with amendments until 1 December 1948. Under the leadership of Mao Zedong (1949–1976), the People's Republic of China experienced an era of collectivization. Similar to Stalin's ideals, Mao tried to rapidly convert the Chinese economy to a socialist society through industrialization and collectivization, in a period known as, "The Great Leap Forward." The era was a disaster for the Chinese people, due to the inability of the farmers to meet quota expectations, which caused "The Great Chinese Famine," where nearly 30 million people died of hunger. After the death of Mao Zedong, Deng Xiaoping reformed the collective farming method. From this time, nearly all Chinese crops began to blossom, not just grain. The reform included the removal of land from rich land owners for use of agricultural land for peasants, but not ownership. This policy increased production and helped reverse the effects of The Great Leap Forward. The two main reasons why China succeeded was because 1) the government chose to make gradual changes, which kept the monopoly of the Communist Party and 2) because the reform process began from the bottom and later expanded to the top. Throughout the reform process, the Communist Party reacted positively to the bottom-up reform initiatives that emerged from the rural population. Deng Xiaoping described the reform process as, "fording the river by feeling for the stones." This statement refers to the Chinese people who called for the reforms they wanted, by "placing the stones at his feet" and he would then just approve the reforms the people wanted. The peasants started their own "household responsibility system" apart from the government. After Chinese trade was privately deemed successful, all Xiaoping had to do was approve its legalization. This increased competition between farmers domestically and internationally, meaning the low wage working class began to be known worldwide, increasing the Chinese FDI. A 2017 study found that Chinese peasants slaughtered massive numbers of draft animals as a response to collectivization, as this would allow them to keep the meat and hide, and not transfer the draft animals to the collectives. The study estimates that "the animal loss during the movement was 12 to 15 percent, or 7.4-9.5 million dead. Grain output dropped by 7 percent due to lower animal inputs and lower productivity." In the late 1990s, the collective farming system collapsed under a strain of droughts. Estimates of deaths due to starvation ranged into the millions, although the government did not allow outside observers to survey the extent of the famine. Aggravating the severity of the famine, the government was accused of diverting international relief supplies to its armed forces. Agriculture in North Korea has suffered tremendously from natural disasters, a lack of fertile land, and government mismanagement, often causing the nation to rely on foreign aid as its primary source of food. The Democratic Republic of Vietnam implemented collective farming although de jure private ownership existed. Starting in 1958 collective farming was pushed such that by 1960, 85% of farmers and 70% of farmlands were collectivized including those seized by force. Collectivization however was seen by the communist leadership as a half-measure when compared to full state ownership. Following the Fall of Saigon on 30 April 1975, South Vietnam briefly came under the authority of a Provisional Revolutionary Government, a puppet state under military occupation by North Vietnam, before being officially reunified with the North under Communist rule as the Socialist Republic of Vietnam on 2 July 1976. Upon taking control, the Vietnamese communists banned other political parties, arrested suspects believed to have collaborated with the United States and embarked on a mass campaign of collectivization of farms and factories. Private land ownership was "transformed" to subsume under State and collective ownership. Reconstruction of the war-ravaged country was slow and serious humanitarian and economic problems confronted the communist regime. In a historic shift in 1986, the Communist Party of Vietnam implemented free-market reforms known as Đổi Mới (Renovation). With the authority of the state remaining unchallenged, private enterprise, deregulation and foreign investment were encouraged. Land ownership nonetheless is the sole prerogative of the state. The economy of Vietnam has achieved rapid growth in agricultural and industrial production, construction and housing, exports and foreign investment. However, the power of the Communist Party of Vietnam over all organs of government remains firm, preventing full land ownership. Conflicts between the state and private farmers over land rights have grown with the potential to spark social and political instability. In the initial years that followed the Cuban Revolution, government authorities experimented with agricultural and farming production cooperatives. Between 1977 and 1983, farmers began to collectivize into CPAs – Cooperativa de Producción Agropecuaria (Agricultural Production Cooperatives). Farmers were encouraged to sell their land to the state for the establishment of a cooperative farm, receiving payments for a period of 20 years while also sharing in the fruits of the CPA. Joining a CPA allowed individuals who were previously dispersed throughout the countryside to move to a centralized location with increased access to electricity, medical care, housing, and schools. Democratic practice tends to be limited to business decisions and is constrained by the centralized economic planning of the Cuban system. Another type of agricultural production cooperative in Cuba is UBPC – Unidad Básica de Producción Cooperativa (Basic Unit of Cooperative Production). The law authorizing the creation of UBPCs was passed on 20 September 1993. It has been used to transform many state farms into UBPCs, similar to the transformation of Russian sovkhozes (state farms) into kolkhozes (collective farms) since 1992. The law granted indefinite usufruct to the workers of the UBPC in line with its goal of linking the workers to the land. It established material incentives for increased production by tying workers' earnings to the overall production of the UBPC, and increased managerial autonomy and workers' participation in the management of the workplace. The move to a collective farming method in Tanzania was based on the Soviet model for rural development. In 1967, President Julius Nyerere issued "Socialism and Rural Development" which proposed the creation of Ujamaa Villages. Since the majority of the rural population was spread out, and agriculture was traditionally undertaken individually, the rural population had to be forced to move together, to farm communally. Following forced migration, incentive to participate in communal farming activities was encouraged by government recognition. These incentives, in addition to encouraging a degree of participation, also lured those whose primary interests were not the common good to the Ujamaa villages. This, in addition to the Order of 1973 dictating that all people had to live in villages (Operation Vijiji) eroded the sustainability of communal projects. In order for the communal farms to be successful, each member of the village would have to contribute to the best of their ability. Due to lack of sufficient foreign exchange, mechanization of the labour was impossible, therefore it was essential that every villager contributed to manual labour. In modern Europe collective farms are very uncommon, although in France (the European Union's largest agricultural producer) cooperative agriculture represents 40% of the national food industry's production and nearly 90 Billion € in gross revenue, covering one out of three food brands in the country. There are also intentional communities which practice collective agriculture. There is a growing number of community supported agriculture initiatives, some of which operate under consumer/worker governance, that could be considered collective farms. In Indian villages a single field (normally a plot of three to five acres) may be farmed collectively by the villagers, who each offer labour as a devotional offering, possibly for one or two days per cropping season. The resulting crop belongs to no one individual, and is used as an offering. The labour input is the offering of the peasant in their role as priests. The wealth generated by the sale of the produce belongs to the Gods and hence is Apaurusheya or impersonal. Shrambhakti (labour contributed as devotional offering) is the key instrument for generation of internal resources. The benefits of the harvest are most often redistributed in the village for common good as well as individual need – not as loan or charity, but as divine grace (prasad). The recipient is under no obligation to repay it and no interest need be paid on such gifts. Collective farming was also implemented in kibbutzim in Israel, which began in 1909 as a unique combination of Zionism and socialism – known as Labor Zionism. The concept has faced occasional criticism as economically inefficient and over-reliant on subsidized credit. A lesser-known type of collective farm in Israel is moshav shitufi (lit. collective settlement), where production and services are managed collectively, as in a kibbutz, but consumption decisions are left to individual households. In terms of cooperative organization, moshav shitufi is distinct from the much more common moshav (or moshav ovdim), essentially a village-level service cooperative, not a collective farm. In 2006 there were 40 moshavim shitufi'im in Israel, compared with 267 kibbutzim. Collective farming in Israel differs from collectivism in communist states in that it is voluntary. However, including moshavim, various forms of collective farming have traditionally been and remain the primary agricultural model, as there are only a small number of completely private farms in Israel outside of the moshavim. In Mexico the Ejido system provided poor farmers with collective use rights to agricultural land. The Anabaptist Hutterites have farmed communally since the 16th century. Most of them now live on the prairies of Canada and the northern Great Plains of the United States. ^ Axtell 1981, pp. 110–111. ^ Axtell 1981, p. 111. ^ Trigger 1969, p. 28. ^ a b Stites 1905, pp. 71–72. ^ a b Johansen 1999, p. 123. ^ "Holodomor of 1932-33 in Ukraine". www.faminegenocide.com. Retrieved 27 March 2018. ^ A. Sarris and D. Gavrilescu, "Restructuring of farms and agricultural systems in Romania", in: J. Swinnen, A. Buckwell, and E. Mathijs, eds., Agricultural Privatisation, Land Reform and Farm Restructuring in Central and Eastern Europe, Ashgate, Aldershot, UK, 1997. ^ a b Kligman, G., & Verdery, K. (2011). Peasants under siege: the collectivization of Romanian agriculture, 1949–1962. Princeton University Press. ^ Iván T. Berend, The Hungarian Economic Reforms 1953–1988, Cambridge: Cambridge University Press, 1990. ^ Nigel Swain, Collective Farms Which Work?, Cambridge: Cambridge University Press, 1985. ^ Chloupkova, Jarka (January 2002). "Czech Argicultural Sector: Organizational Structure and its Transformation" (PDF). ^ German translation of the Law of 23 August 1945 with amendments until 1 December 1948. ^ "How China Won and Russia Lost". hoover.org. Retrieved 27 March 2018. ^ a b Chen, Shuo; Lan, Xiaohuan (2017). "There Will Be Killing: Collectivization and Death of Draft Animals". American Economic Journal: Applied Economics. 9 (4): 58–77. doi:10.1257/app.20160247. ISSN 1945-7782. ^ "XÂY DỰNG CHỦ NGHĨA XÃ HỘI Ở MIỀN BẮC (Building socialism in the North)". go.vn. Retrieved 27 March 2018. ^ "Tạp chí Cộng Sản - Vấn đề văn hóa trong tư tưởng Hồ Chí Minh về phát triển đất nước". www.tapchicongsan.org.vn. Retrieved 27 March 2018. ^ "Tổng Cục Quản Lý Đất Đai". www.gdla.gov.vn. ^ "Property disputes are Vietnam's biggest political problem". 15 June 2017 – via The Economist. ^ Lange, Siri. (2008) Land Tenure and Mining In Tanzania. Bergen: Chr. Michelson Institute, p. 2. ^ "La coopération agricole, un modèle entreprenarial". www.lacooperationagricole.coop. Retrieved 27 March 2018. ^ "Les grandes coopératives agricoles, ces entreprises françaises en plein boom". latribune.fr. Retrieved 27 March 2018. ^ Y. Kislev, Z. Lerman, P. Zusman, "Recent experience with cooperative farm credit in Israel", Economic Development and Cultural Change, 39(4):773–789 (July 1991). ^ Statistical Abstract of Israel, Central Bureau of Statistics, Jerusalem, 2007. ^ "The Hutterian Bretheren". University of Alberta. Retrieved 6 October 2013. FAO production, 1986, FAO Trade vol. 40, 1986. Conquest, Robert, The Harvest of Sorrow: Soviet Collectivization and the Terror-Famine (1986). "Peasant Participation in Communal Farming: The Tanzanian Experience" by Dean E. McHenry, Jr. in African Studies Review, Vol. 20, No. 3, Peasants in Africa (December 1977), pp. 43–63. "Demography and Development Policy in Tanzania" by Rodger Yeager in The Journal of Developing Areas, Vol. 16, No. 4 (July 1982), pp. 489–510. This page was last edited on 10 April 2019, at 16:25 (UTC).